Nurturing, loving, devoted, cuddly, milky and self-centered, Cancer has it all. Your sign is not multifaceted; rather, you change like the tides, and are a little different every single day. Less polite people call you moody. What, not everyone has moods? Why do they all take things so personally? Or is it you who takes others so personally? In any event, those born under your sign possess a certain desire for intimacy that is mingled with defensiveness about getting too close to others, and this can send a mixed message. It’s important that you have a sense of control in your relationships, but you don’t want to take that too far. You won’t respect weak people, so you may as well surround yourself with strong ones who respect your space and who feel at home in your home. It is sometimes said that the crab walks sideways, and your most important learning in this life is to be direct about what you feel and what you want, without feeling guilty about it. Your inclination is to experience your relationships in a structured way; you would have more fun if you would be more flexible. Remember that the people you love now are not as powerful as your mother was, so don’t treat them like they’re her. Keep a Moon calendar on your desk and know the current phase and sign all the time. 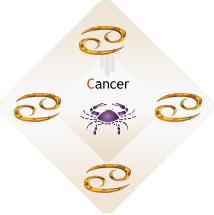 Cancer is one of the water signs, and is also a cardinal sign, being the beginning of summer in the Northern Hemisphere and winter south of the equator. If you want to know more about yourself, study the position of the Moon in your chart, as well as what are called the lunar nodes. These will reveal the deeper elements of your nature, and more than any other sign, the Moon’s house, sign and aspects may reveal your most authentic nature.